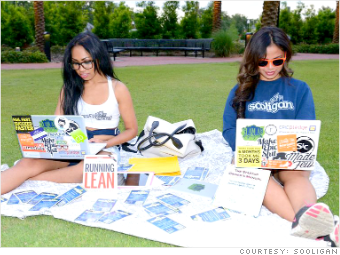 Nikka Umil and Natasia Malaihollo were already in the heart of California's tech scene when they decided to take their startup Sooligan east -- to Arkansas. The Berkeley grads left the Golden State last fall after being accepted into a 14-week program at the Fayetteville-based ARK Challenge business accelerator. They created an app that lets users find and share information about any city in the world -- from restaurant and shopping tips, to weather and traffic reports. It's geared toward people who are traveling or moving to a new city, said Umil. The ARK Challenge provided Umil and Malaihollo with office space, $15,000 in seed capital and access to extensive mentor networks. They launched the app in February, much earlier than they would have been able to in California's crowded startup community, according to Umil. Sooligan currently has 4,500 registered users and is active in 25 cities. The next step: "We really want to have this take off with university students," said Umil.